Big Chill - Small Space! Linis™ Professional High Efficiency Cooling System for a Contiuous Supply of Cold Refreshing Water Right Where You Need It. High quality Galvalume for better corrosion resistance than Galvanized Iron. Hygienic electropolished stainless steel. External refrigerant evaporator mechanically wrapped around tank. Temperature is controlled to 35.6°F~53.6°F(2°C~12°C) by adjustable thermostat, easily accessible at the back of cabinet. 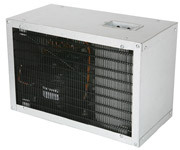 Convection cooled condenser, internally spring mounted hermetically sealed compressor with automatic overload protector. Refrigerant is controlled by accurately calibrated capillary tube. Highly efficient cooling system. Units of other power supplies available upon special order.